This is the bag that disrupted the travel industry. Designed and engineered by women, for women, who value premium functionality, quality, and style. Made with top-grain pebbled leather and designed with premium gold hardware accents. Inspired by the original garment weekender bag with enhanced features. Including an in-line expandable garment section, perfect for hanging items including long dresses. Expanded handles allow the bag to be carried in a variety of ways, including the forearm or over the shoulder for maximum comfort. This bag is ideal for the overnight, weekend getaway, or business trips. Fully unzipped, the garment section can easily accommodate your most delicate dresses or suits. Once the duffle is reconstructed, the main compartment houses two accessory compartments, shoe pockets, and plenty of room for all of your other travel essentials. The shell is made of top-grain pebbled leather. The front side houses a suede lined zippered pocket with premium hardware from YKK. A sliding shoulder strap makes carrying the bag comfortable and functional. Dimensions: 19.75" x 12.25" x 9"
Interior garment section allows you to hang dresses or blouses via a hanger loop or direct, using custom shoulder strap snaps. Water repellant lining for increased security. Side flaps transform into handy shoe pockets. Two additional internal accessory pockets. Increased handle height and adjustable shoulder strap make carrying the bag comfortable in a variety of positions. Weighing in at ~3.75lbs, this is one of the lightest, full leather bags on the market! Top Grain Pebbled Leather accented with premium hardware from YKK. For easy storage when not in use. 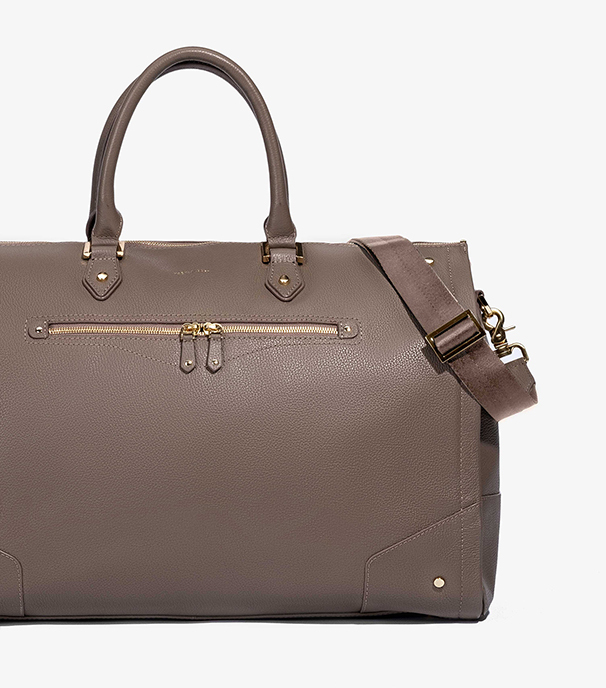 For the first time ever, the critically acclaimed garment weekender bag is available for women! With a female first focus, this bag is designed and engineered for women who value lightweight functionality and fashion.